So, let's talk for a minute about my goal of reading all the Newberry award winners from the past 5 years. It's looking like I'm not going to make it by the end of the year. My original plan was to post each year, complete with reviews, once I had read them. However, it's taking me quite a bit longer to read them then I thought it would. Between the move and our new library's 5-item limit for new patrons, I haven't checked out very many hard copies of library books this year. (Just a couple of weeks ago I was able to get my card switched over to a regular patron card, which comes with a 30-item limit. Finally!) I have not purchased them either, because what if I don't like them? So. What I'm going to do instead is post the individual reviews as I go. Several of the years I have read most of the books and already posted reviews on Goodreads. Once I get a complete year done, I will do a new post listing all of the books and linking to reviews if need be. I know you are on the edge of your seats for that to come! So let's talk about this book! 3 stars: Liked it; didn't love it. Ivan the gorilla lives in a mall right off the freeway, where folks come and see him. There's also an old circus elephant named Stella who does a few tricks, and a few other animals. Bob the dog is a stray, but sleeps on Ivan's stomach most nights. Ivan is not the fearsome animal his billboard makes him out to be. In fact, he is an artist. His owner, Mack, sells his paintings for $20 in the gift shop ($25 framed). 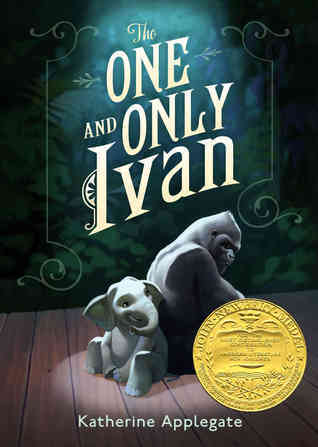 Ivan is resigned to his life, with the short beginning and endless middle, until baby elephant Ruby joins the menagerie. Stella makes Ivan promise to protect Ruby and take care of her, once she is gone, and Ivan agrees. As time goes on, things go badly for Mack. Numbers are dwindling, and Mack is getting desperate. None of the animals are being treated right, but especially baby Ruby is suffering. Ivan must figure out how to keep his promise and get Ruby out of there. If only the humans could understand his art. One special little girl named Julia may be just the person to make the connection. I didn't love this as much as most other people. I don't know if I could even tell you why. It has some good messages in it, and the characters are each distinct and well-written. I guess I was having a hard time suspending my disbelief. It's strange, because that's usually not a problem for me. I read books with talking, thinking animals in them quite often, but for some reason, I didn't really get into it this time. I just found out that it was based on a real gorilla named Ivan who lived in a mall, then eventually got moved to the Atlanta Zoo. (Yes, if you've read it, you probably already knew that.) That makes me like it more.